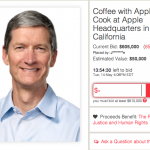 Coffee with Tim Cook has just set one CharityBuzz bidder back $610,000. 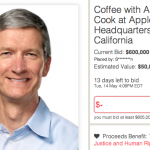 After several weeks of gradual bidding, the online auction offering bidders a 30 to 60 minute coffee meeting with Apple CEO Tim Cook has ended with a winning bid of $610,000. The successful bidder, "a********s," along with one friend, will be able to travel to Apple's headquarters and enjoy the tête-à-tête with Cook "on a mutually agreed date," according to the auction's notes. The winning bid is $5,000 up from the auction's previous high bid of $605,000, which had held the top spot for some time, and was only overtaken 30 minutes before the auction closed. Proceeds will benefit the RFK Center for Justice and Human Rights. We'll let you know if any news concerning the successful bidder surfaces online. Let's just hope Cook pays for the cappuccinos! 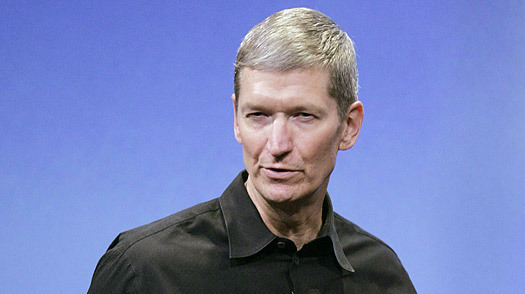 Can You Believe What This Person Did Just For A Chance At Coffee With Tim Cook?